New members will be required to complete the following minimum requirements in order to achieve and maintain Active Membership. The Volunteer Basic Orientation Course is the first course that new members take when joining the department. The purpose of VBOC is to teach new members basic of Fire and EMS terminology, safe working practices, the National Incident Management System (NIMS) and specific information for volunteering as part of the Montgomery County Fire Rescue Service (MCFRS). Additionally, VBOC is a great opportunity to meet new volunteers and make connections that will assist you in your future fire service training. The intent is that a new member will finish VBOC and then be prepared to take the EMT-B class that follows soon after. The Protective Envelope and Foam (PEAF) course teaches new volunteers how to use structural firefighting personal protective equipment (PPE). Students will practice putting on and taking off the firefighting gear and Self Contained Breathing Apparatus (SCBA). This course is required for both EMS Only and Fire/EMS members. The Hazardous Materials Operations for First Responders Course teaches new members how to recognize a hazardous materials incident, take protective action, and request the appropriate response. New members will learn how to assist with incidents that involve hazardous materials. As part of this course, new members learn how to use the Emergency Response Guidebook (ERG) and how to safely assist with decontamination operations. The Emergency Medical Technician Course provides students with the knowledge, skills and abilities necessary to perform emergency medical care in a pre-hospital environment at the basic life support level. Upon successful completion of this course, the student will be able to recognize, assess, and manage medical and trauma signs and symptoms in patients in emergency situations; determine and use appropriate equipment for patient management and care; communicate and work with other emergency service personnel in the care, transport, and transfer of patients; and maintain patient and department records. All members are required to ride at least one shift per week. Members are assigned to a regular weekly shift night that is determined based on the member’s availability and the department’s staffing needs. All members are required to attend a minimum of 8 of 12 monthly membership meetings. We have an inclusive membership structure, with 8 types of membership to allow individuals from all backgrounds and experience levels to participate in supporting the community and the department. Emergency Medical Technician – Apply Today! Volunteering as an Emergency Medical Technician is mentally and physically demanding; you will be asked to intervene and provide exemplary service during the worst moments of people’s lives. Your training is very extensive but manageable if you have strong time management skills. There are a series of training courses which equate to 172 classroom hours to attain the status of Emergency Medical Technician-Basic; at this level of certification you may be charged with managing an entire ambulance crew. By the end of your initial training you will be proficient in CPR and how to handle cardiac as well as respiratory arrest, heart attacks, seizures, diabetic emergencies, respiratory problems, and other medical emergencies. You will also know how to manage traumatic injuries such as falls, fractures, lacerations, and burns. You will find that your training is intellectually stimulating and will compliment your professional work or education; in addition to the specialized skills acquired, you will become a leader among your peers and learn new management strategies. The possibilities for advancement in this position are unbounded. Following completion of EMT-B class, you can take courses to become a paramedic (EMT-P), or EMS supervisor. All training is provided free of charge and is strongly encouraged. You will find that your training is intellectually stimulating and will compliment your professional work or education; in addition to the specialized skills acquired, you will become a leader among your peers and learn new management strategies. The possibilities for advancement in this position are unbounded. Following completion of EMT-B class, you can take courses to become a paramedic (EMT-P), or EMS supervisor. All training is provided free of charge and is strongly encouraged. Following completion of EMT-B class, you can take courses to become a paramedic (EMT-P), or EMS supervisor. All training is provided free of charge and is strongly encouraged. This role is physically and mentally demanding; you will be asked to intervene and provide exemplary service during the worst moments of people’s lives. Your training is very extensive but manageable if you have strong time management skills. To become a fully licensed, certified and ranking Firefighter II, you will take a series of training courses which equate to around 400 hours of class time. Upon completion of additional training, you will also have the opportunity to join a specialized rescue team such as: River Rescue and Tactical Services; Dive Rescue and Recovery; Urban Search and Rescue; and Hazardous Materials. You will find that your training is intellectually stimulating and will compliment your professional work or education; in addition to the unique skills acquired, you will become a leader among your peers and learn new management styles. The possibilities for advancement in this position are limitless. Realistically, you can acquire the credentials needed to become an officer in only two and a half years. All training is provided free of charge and is strongly encouraged. You will find that your training is intellectually stimulating and will compliment your professional work or education; in addition to the unique skills acquired, you will become a leader among your peers and learn new management styles. The possibilities for advancement in this position are limitless. Realistically, you can acquire the credentials needed to become an officer in only two and a half years. All training is provided free of charge and is strongly encouraged. your community while gaining invaluable life-saving experience. Volunteer Emergency Medical Technicians in Montgomery County, MD are known throughout the world for their extraordinary clinical and driving skills, advanced training and consistent high-level of performance. EMTs perform many duties besides answering 911 calls; in this role, you may be asked to assist with public education campaigns and engage the community during fire department open houses as well as other local events. New members shall serve a minimum of one-year probation during which time they shall have no vote and may hold no elected or appointed office. 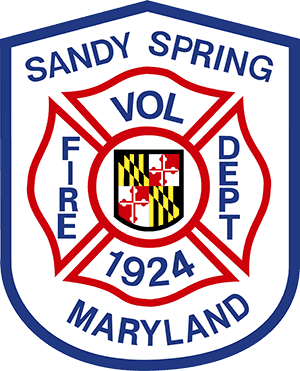 Active members of other fire/rescue corporations transferring to Sandy Spring and meeting the current Montgomery County training standards shall serve a minimum of six months probation during which time they shall have no vote and may hold no elected or appointed office. All Probationary members shall attend at least 2/3 of all Regular or Special Membership meetings during their respective probationary term. Serve as an EMS Provider I. Many members receive additional training to become firefighters. Volunteering as a firefighter/EMT in Montgomery County, MD is personally rewarding and an excellent avenue to serve your community. Montgomery County volunteer firefighter/EMTs perform many duties besides putting out fires; your cutting edge training will prepare you to respond to a variety of unique fire suppression and rescue situations. Firefighter/EMTs provide critical aid on calls which can range from major car accidents to river and mountain emergencies. Achieve Certification as an EMS Provider I, as prescribed by the Montgomery County, Maryland Fire and Rescue Commission and having obtained “officer in charge” status, as determined by the Fire Chief, are the minimum requirements for attaining and maintaining Active membership. If an Active member is unable to maintain his or her EMS Provider I certification and/or his or her “officer in charge” status is revoked by the Fire Chief, the individual shall automatically be reclassified to Probationary membership. Support the department with a variety of auxiliary activities, including staffing the canteen unit deployed at major events in the county. The purpose of the Auxiliary from its inception has been to aid and support the Sandy Spring Volunteer Fire Department. meetings of the Auxiliary shall be entitled to all the rights and privileges of Active or Administrative members without fulfilling the requirements of Active or Administrative membership. Voting privileges are granted to Auxiliary members having attended one of the immediately preceding four Regular Membership meetings or having obtained LOSAP credit for the prior calendar year. Administrative members must attend 2/3 of all Regular or Special Membership meetings per calendar year and serve the Department in its administrative activities. An approved Administrative Members’ Activity Report shall be compiled by each Administrative member and shall document the activities of such Administrative member. Junior membership shall be available to persons 16 or 17 years of age provided they are a student or are gainfully employed. They shall submit an application for membership with a signed letter of approval from a parent or guardian. During the period of Junior membership he or she shall be required to learn the fundamentals of firefighting and/or emergency medical care and enroll in basic courses in firefighting and/or emergency medical care as they become available. This special honor may be conferred on any persons who have rendered outstanding service to the Department and upon whom the Department cares to bestow this honor. This honor may be conferred at any Regular meeting upon a 2/3 favorable vote of those eligible members present and voting. Honorary members shall have no vote on matters coming before the membership. Any Active or Administrative member who has completed a total of 10 years of voter eligible membership and is in good standing in this Department shall be presented to the membership for election to Life Membership. Such member must receive a 2/3 favorable vote of those eligible members present and voting at a Regular Membership meeting. The mission of the body of Associate members will be to assist the Fire Department with activities as deemed necessary by the President or Fire/Rescue Chief that do not require a permanent membership in the department.